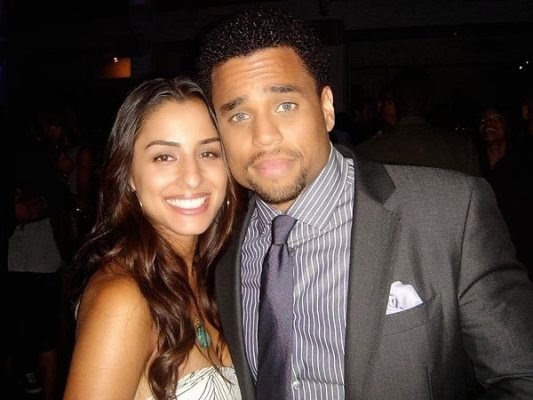 Handsome Hollywood actor Michael Ealy, 40, married Khatira Rafiqzada, 32 (pictured above with him) in October 2012 after dating her for four years. But now he says she's not his type.. While, I don’t consider myself a person that should write a book, or give advice on relationships, what I will share is my personal perspective. What helped me along the way was I had two personal friends of mine whose fiancés died. And I went through a personal struggle where my father got really sick, and I spent a week with him and it just dawned on me that we don’t have as much time as we think. And when you’re done playing games, and you find someone who has qualities that are much more practical as opposed to romanticized ideals, then you've got to hold on to them. People think that you’re supposed to marry your type … well, I didn’t marry my type. It’s much more practical, and based in a day-to-day existence. So when you have that, and you’re happy, and you love her, don’t waste time. Because time — and I’ve learned that at this point in my life — time is my most precious commodity. Nothing is more precious than time. Because when it runs out … that’s it. Who agrees with him? Shouldn't you marry your type?